Stressed about where your passport is? Overwhelmed by all the packing? Sometimes even just the holiday prep can leave the calmest among us tearing our hair out. But what if there was a way to ensure that you kept your holiday cool for the entire trip? We’ve all done it. You’ve left the packing until the last minute, you still need to print off your boarding pass and you’re best top is still in the laundry basket. Make a holiday checklist a few nights before and allow yourself enough time to prepare so that you don’t just look good (fake tan — check, shirts ironed —check) but you feel good, too. If your holiday prep starts stressing you out, take two minutes to close your eyes and focus on your breathing. You can do it on the plane, in your hotel room or whilst you sunbathe by the pool. Mind you, meditating on the warm sands of Baga Beach, Goa has to be more appealing than doing it on the tube! Have you ever been sunbathing in paradise only to find yourself worrying about something you’ve forgotten to do at work? Yep, thought so. Take yourself out of your thoughts by just practising ‘being’ in the moment., Just 20 minutes a day of mindfulness has proven to be effective. Sunrise and sunset sessions are a great introduction. 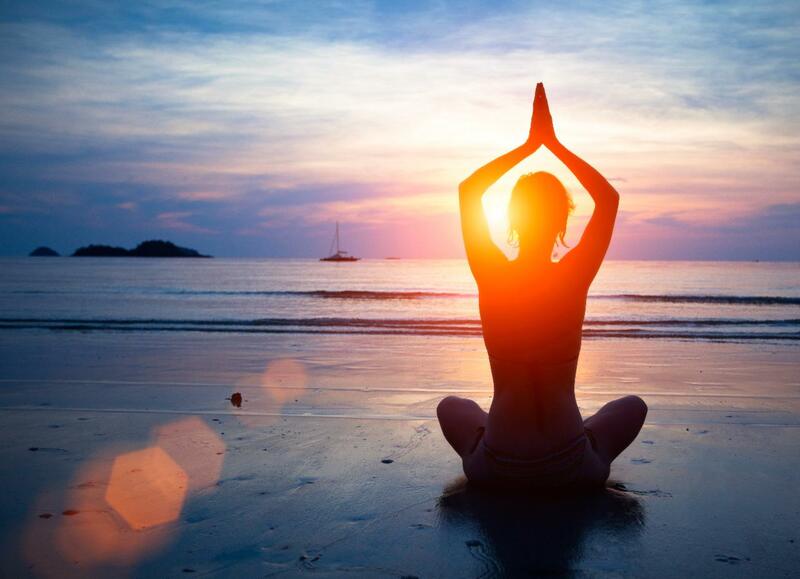 Places that are big on yoga include The Maldives, Thailand or Goa. Classes will usually be offered when it’s cooler, usually in the morning or evening. Yoga (especially Hatha) and meditation go hand in hand. Breathing is one of the most important things we do as living beings so focus on it and tune in with your body. Dip your feet in the waves or brush the sand with your fingertips. If your mind wanders, that’s okay – just bring your attention back to the present. Take time to focus on all of those delicious holiday meals and pay attention to the tastes. Listen to the sound of the sea and tune into what’s going on around you. Experts recommend 30 minutes of aerobic activity a day. Whether you prefer walking, swimming, running or yoga, exercise increases serotonin, which in turn helps you to relax. So, when that child is kicking your plane seat on your way home and the man in front of you is going red with rage at his TV not working, remember to take a deep breath, smile and just ‘be’.